Don't Buy Warn Zeon Platinum Winch Before You Read This. This winch is only for true off roader. If you don't consider yourself one, you don't need this. The Zeon Platinum is not for those who want some cheap easily broken winch when your car is stuck in your deepest mud. The winch is also not for those who are OK to manually turn on and change the clutch of your winch. This is the real deal winch which can be operated wirelessly using the remote control. Best for Wrangler and Jeep. For fellow off roaders, we have all been there, in the middle of no mans land, stuck in the mud or snow in some alien part of the earth. And worse with no way out, while at best facing a daunting vehicle recovery. Fortunately your Jeep is equipped with the winch valued more than gold, a platinum. 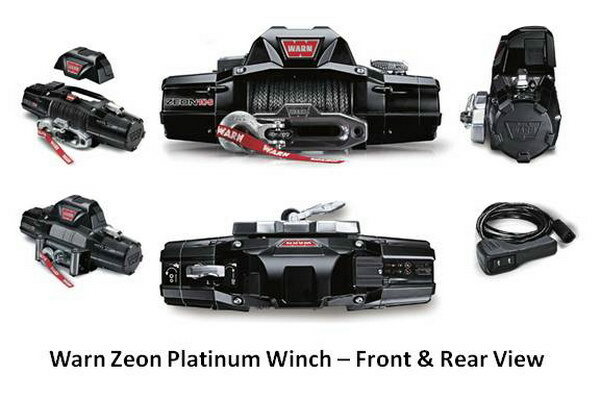 The Warn Zeon Platinum is the most technologically advance winch ever created. The heart and soul alliance is the high tech remote control. Reliable and build for extreme condition, this remote will let you engage and disengage the winches clutch, power the winch in and out, and control two of the accessories with just a push of the button. No other winch has a high technology, ease of use and reliability of the Warn Zeon. Using the wireless remote, now you have total command on the palm of your hand. Zeon platinum eliminates the manual clutch levering. It is the first to introduce technology to remotely control the clutch. Instead of manually reaching the clutch handle to engage the winch, simply reach for your remote, now the clutch is in your hand not on the winch. Imagine how sweet it is to operate the winch from inside your car. If you are traveling solo, this is very beneficial. It only takes two push of a button to disengage the rope and engage the winch power. Imagine a situation where you car is stuck and the clutch handle is in the unreachable position. The wireless remote will come very handy. The remote controller is also equipped with a lcd screen to provide the critical information you need to analyze during the toughest environment. This will enable faster and more efficient vehicle recovery from the mud, sand, water or snow. The display also monitor the battery level, an important for a long and difficult vehicle recovery. With this information, you can phase the recovery process and not to worry exhausting the power supply. The advanced remote controller also display the temperature of your winch motor, protecting the motors during the most extreme pulls. Maintaining the motor temperature and do not overheating it will significantly increase the life time of the winch motor and parts. One of the advantages of Zeon Platinum is the ability to control multiple accessories remotely, whether it is a spotlight, a light bar or an onboard air compressor. The Zeon from Warn can control all of them from a single place. Warn Zeon Platinum Winch Installation. Installation is easy. Simply use the wiring cables, plug the accessories in to the winch and you are ready to go. The Zeon Remote controlled can be charged using standard micro usb cable. The remote can be easily mount by attaching to any flat surface in your dashboard. If you are considering this winch, you can get it on many local or online stores. We find that Amazon has the best offer, simply click here to compare the price of new or refurbished one.